Plan your next event at the Issaquah Senior Center! Our facility, located in historic Olde Town Issaquah, is perfect for celebrations, receptions and more. 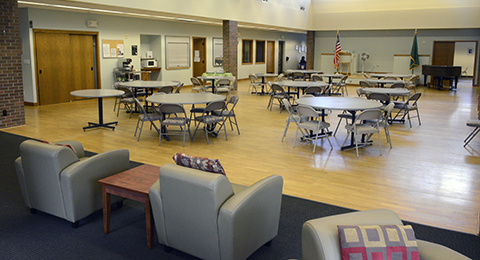 Get inspired with sample layouts of the Senior Center. We have an open-door catering policy, which allows you to bring in a caterer of your choice. All food must be prepared in a commercial kitchen, purchased from a commercial store or delivered from a restaurant. The Senior Center does not provide a commercial kitchen. All alcohol (beer and kegs of beer, wine, champagne and hard alcohol) is allowed at the Senior Center. All alcohol must be served by a licensed Class 12 bartender. No self-serve is allowed. Use of privately-provided alcohol, including flasks, is not allowed. Service must end one hour prior to your rental end time. Event insurance may apply — please discuss the requirements and cost with the Senior Center.